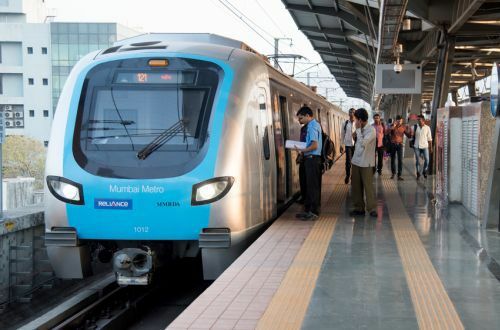 New Delhi: The Delhi Metro Rail Corporation (DMRC) today issued global tender notice for Design, Manufacture, Supply, Testing, Commissioning and Training of 378 Numbers of Standard Gauge Metro Rail Cars (Rolling Stock) for Mumbai Metro Rail Investment Project. Estimated cost of work is INR 3900 Crore. Tender documents can be purchased from 28.04.2018 (1000 hrs) to 11.06.2018 (1730 hrs). 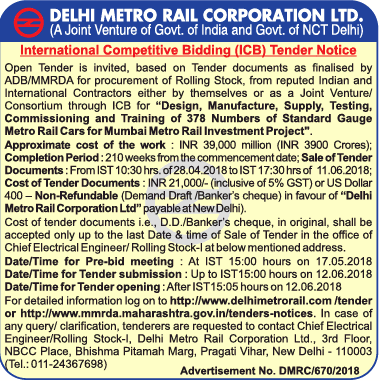 Pre-bid meeting fixed on 17.05.2018 at 1500 hrs in the Office of Chief Electrical Engineer/Rolling Stock-I, Delhi Metro Rail Corporation Limited, 3rd Floor, NBCC Place, Bhishma Pitamah Marg, Pragati Vihar, New Delhi-110003 (near J.L.N. Stadium Metro Station). Last date of tender documents submission is 12.06.2018 up to 1500 hrs and tender will be opened on same day at 1505 hrs. Mrs. Mamta Shah is Managing Editor of Metro Rail News. She is one of among the team of Founder Directors of the Symbroj Media Pvt. Ltd.